The waters between Vancouver Island and mainland British Columbia are alive with herring, which are the staple in the food chain. Diving birds and ducks feed on the herring and forces them into “herring balls” which are a tight mass of swirling herring from the size a basketball to the size of a small boat. The duck force them to the surface where the seagulls and eagle dive into to feed. As a guide I try to locate these balls by watching the gulls, then position the boat near the gulls and wait for the humpbacks to come and feed. 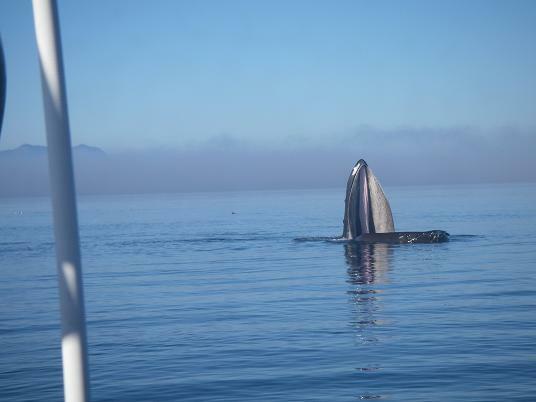 If all work as planned then we get a photo such as the one above with a humpback whale taking in a mouthful of herring. 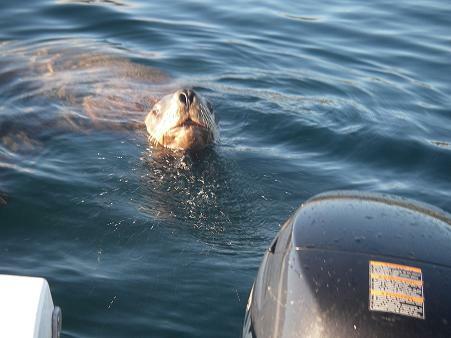 Most days on your whale-watching safari we find steller sea lions. Although most pass through this part of BC’s coast on the way to and from Alaska in the spring and fall some do stay all summer. If we eat our picnic lunch in the area around Vancouver Island’s Telegraph Cove the sea lions often come to check us out so their picture is added to the bucket list. 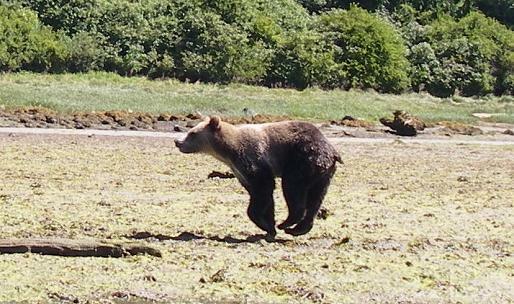 This grizzly took an interest in something at the waters edge and ran in that direction. I had to move the skiff to the opposite side of the river as it ran by the boat approximately ten meters of thirty feet way. 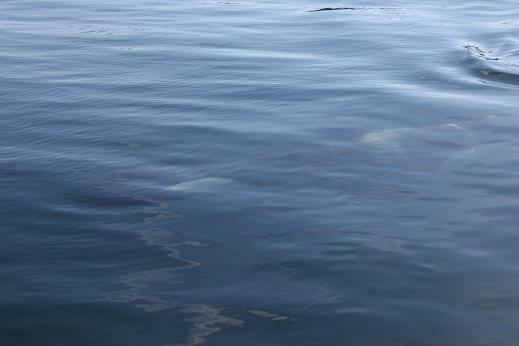 This bear did not even look in our direction but ran into the water and started to swim back and forth along the shore of the bay. We still do not know what prompted this behaviour but the bear stayed there for about twenty minutes before moving further along the shore and we proceeded up river and saw several more grizzly bears. 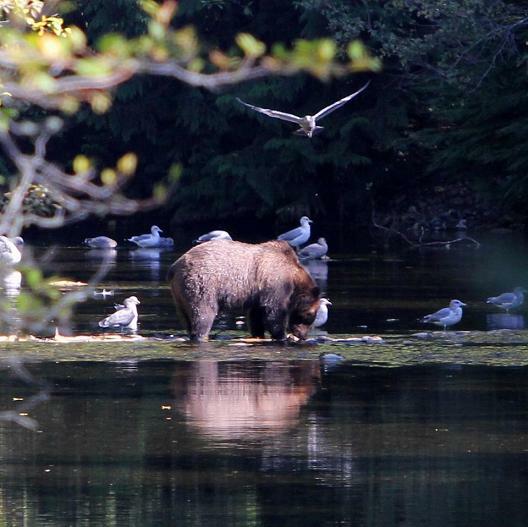 As we move up the river with the rising tide the grizzly bears often move down river in search of salmon. The long lens is no longer necessary. This is when the guests start to discuss their comfort zone and decide they have not reached it yet. More tomorrow. 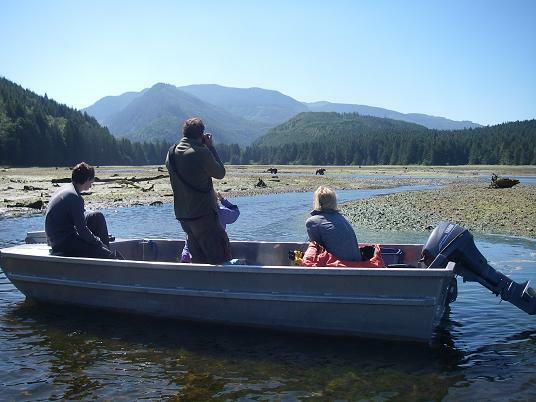 On your spring and early summer tour day with the grizzly bears we are in the boat and leaving the lodge by 8:00. It is and hour and fifteen minute boat ride up Knight Inlet to the Glendale River. On the trip up the Inlet I look for black bears, eagles, dolphins while the guest enjoy the scenery. Upon arrive we get into a sixteen foot skiff which we use to travel in the shallow waters of the river estuary. This morning has a low tide and we are waiting for the tide to rise so we can move up the river. And NO the guest are not alone at this point the guides are in the water pulling the boat up the river that is why the motor is raised. Notice the grizzlies close enough for a long lens. More tomorrow. 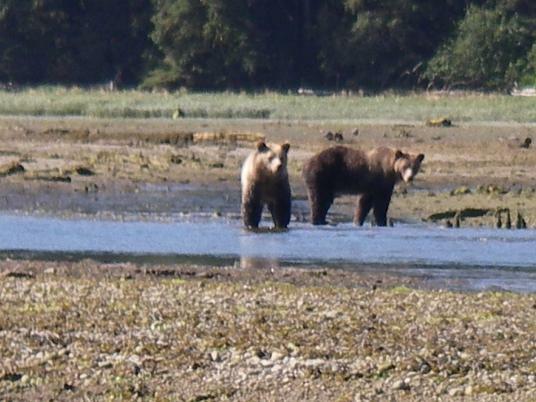 Spring in Knight Inlet does bring some large grizzly bears to the lodge’s tour area in the Glendale River estuary. The spring and early summer bears are eating the high protein sedge grass or turning over beach rocks in search for other forms of protein. These are good-sized grizzlies for the spring. They are keeping a wary eye on the viewing boats. This is a low tide, which means the guests are in a sixteen-foot skiff and we are working our way up river and providing opportunities for good photos and memories. 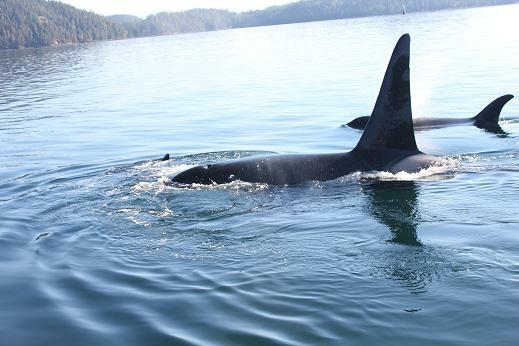 Although we do see some orca in Knight Inlet we spend more time in BC’s coastal waters off Eastern Vancouver Island in an area around Telegraph Cove and Black Fish Sound. (Black Fish being another name for Orca.) Orca being members of the dolphin family are curious and will often approach boats if they are sitting quietly as shown by the photos in the previous days posting. This photo by Glen makes it a little clearer. 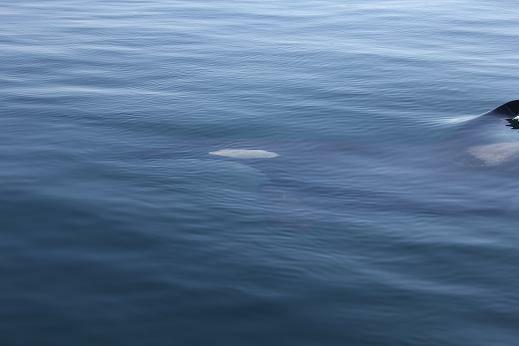 This is a photo taken this past summer by Glen one of our guides. Tomorrow’s post will give you a better view. 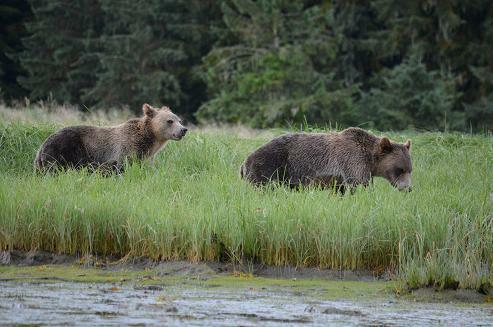 The spring and early summer Grizzly Bear tours from our lodge on Minstrel Island find the bears along the shore of Knight Inlet. 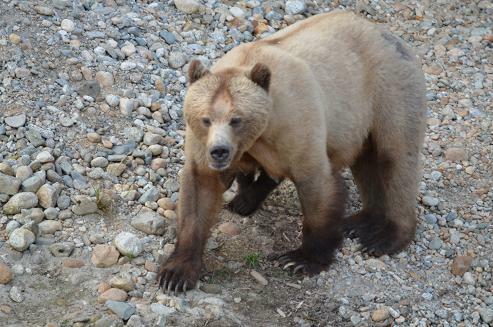 The early spring grizzlies are not as fat as the fall bears and occasionally show sign of the time in the den. Notice mom’s back and hind leg and the rubbed off fur. It is also obvious that this is a nursing bear but the cubs learn at an early age to turn rocks and to supplement mom’s milk. The tour leaves the lodge about 8:00 and we start looking for bears immediately. Normally black bears for the first half of the boat ride and then grizzly bears once we are closer to the Glendale River estuary which is about 25 kilometers up the Knight Inlet from the lodge. As the tide rises and we move up river the photos improve and as tomorrows posting shows more grizzly bears join the tour.